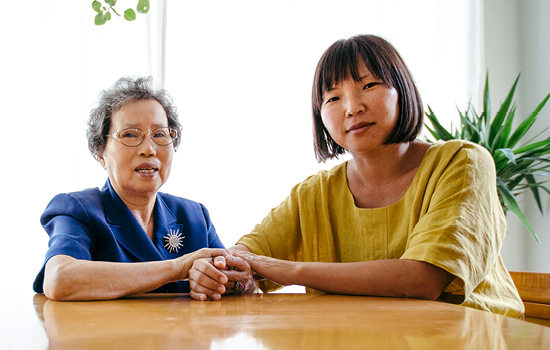 Joung Ja Lee (left) is a patient at the Integrated Memory Care Clinic, which helps her daughter, Esther Lee, manage her care for multiple chronic conditions, including dementia and hypertension. In her prime, Joung Ja Lee helped her husband Keun So run a convenience store in North Florida. Customers depended on the Lees for gas and groceries for many years. Now with advanced vascular dementia and Alzheimer's disease, Joung must depend on her daughter, Esther Lee, and the nurse-led team at the Emory Integrated Memory Care Clinic (IMCC) to manage her condition. Open since 2015, the IMCC has quickly become a model of care for patients like Joung. It is the first nurse-led clinic in the nation specializing in primary care for dementia patients and the first nurse-led medical home at Emory Healthcare. Esther recently brought her mother to the IMCC for a checkup. The normally feisty 78-year-old wasn't feeling well. Her arms and legs ached, her hands felt sore, and she was tired and cold all the time. • Just over 300 patients treated since opening in 2015, with an enrollment goal of 600 patients. • Offers classes for caregivers on the various stages of dementia, including the "Savvy Caregiver," co-developed by School of Nursing Professor Ken Hepburn PhD. Joung takes several medications daily—for hypertension, arthritis, osteoporosis, and depression related to her dementia. Her daughter talked calmly and candidly with nurse practitioner (NP) Alison Schlenger 07N 08MN APRN-BC GNP-BC, who manages her mother's care at the IMCC. "We're reaching a crucial point, I'm starting to see," says Esther. "Mom stopped taking her medication for depression because she thought she was cured." Schlenger listened carefully to Esther as she examined Joung and soon had an explanation as to why her patient wasn't feeling well. Lab results showed that Joung's hemoglobin level and red blood cell count were consistently low, making her feel tired. Her GFR (glomerular filtration rate), a measure of how well the kidneys filter out protein, indicated stage 3 chronic kidney disease. "This type of kidney disease is not uncommon in older patients with hypertension," she told Esther. "We'd like to get nephrology on board with a consult to make sure your mother stays functional." By the end of her visit, Joung had completed new lab work, a dosage change in her arthritis and depression medications, and an appointment scheduled with an Emory nephrologist. When Schlenger noticed that Joung had two appointments scheduled at the Emory Brain Health Center in the same month, she switched them to the same day. For Schlenger and the rest of the IMCC team, making life easier for dementia patients and their families is what it's all about. "Our goal," she says, "is to identify and manage symptoms of dementia, prevent and treat co-existing health conditions, and support families in order to optimize quality of life for every patient." The IMCC care team discusses the day's cases. Carolyn Clevenger (second from left) co-established the clinic in response to patients and families who expressed a need for primary and dementia care in one location. The IMCC is a medical home that integrates memory and primary care for patients and families. By design, medical homes streamline care. 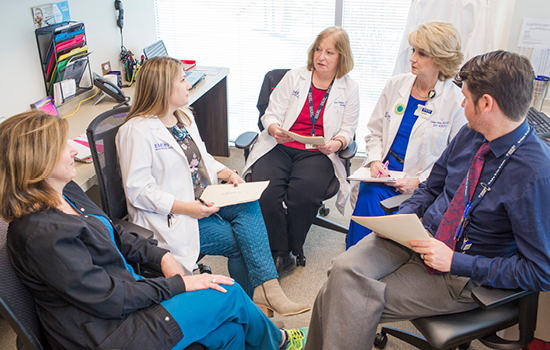 A health team­—nurses, physicians, social workers, and others—provides primary care and coordinates care with specialists and community services. Their goal: to provide better care, improve health outcomes, and lower health care costs for patients. At the IMCC, patients receive care for behaviors related to memory loss, co-existing chronic conditions such as hypertension and diabetes, minor illnesses such as colds and urinary tract infections, and minor injuries. Nurses are the frontline clinicians at the IMCC, where each patient sees a triage nurse and one of three NPs trained in neurology, geriatrics, and palliative care. A patient services coordinator, clinical social worker, and supervising physicians in neurology and geriatrics round out the staff. In addition to medical care, the clinic offers support and training for caregivers and advanced care planning for patients and families. Day or night, NPs are available by phone to help caregivers manage minor problems on their own and save a trip to the clinic or emergency room. Nurses check back to see how their patients are faring. When a trip to the IMCC is warranted, patients are seen within 24 hours. Already, hospitalization rates for patients have decreased, from 4% in 2015 (during the clinic's start-up phase) to below 2% in 2017—well below the 13% national estimate cited in JAMA Internal Medicine (September 2016). "Our 24/7 access that patients and caregivers have to our on-call nurses is the major reason for the drop in hospitalization and emergency department usage," says Carolyn Clevenger 02MN DNP FAANP, clinical director of the IMCC and a School of Nursing faculty member. "It reflects the quality of care that sets the IMCC apart from similar clinics." The idea for the clinic evolved from Clevenger's work with Janet Cellar DNP at the Emory Alzheimer's Disease Research Center. Both saw the difficulties patients and families faced in navigating appointments with different providers and determining which tests and treatments are needed. Cellar led clinical operations at the IMCC until she retired in May 2017. "Families told us they needed dementia-sensitive primary care," says Clevenger. "Everything from pneumonia vaccines, mammograms, or diabetes management needs to be addressed through the lens of a progressive illness that limits a patient's lifespan. Having one place that manages all these things is a great service." Word of the IMCC has spread. To date, the clinic has treated just over 300 patients, with an enrollment goal of 600. Most patients live no more than 60 minutes away. They generally are referred by primary care clinics at Emory Healthcare and the Memory Disorders Clinic, located on the same floor as the IMCC in the five-story Brain Health Center at Emory's Executive Park campus. Interdisciplinary in scope, the IMCC is a partnership between the School of Nursing and the Department of Neurology in Emory's medical school and was launched with $1 million gifts to each from two anonymous donors. The Emory Palliative Care Center, the Department of Psychiatry and Behavioral Sciences, and the Division of Medicine and Geriatrics also play a role in providing cost-effective continuity of care for dementia patients. Greg Esper MD, Emory Healthcare's director of new care models, points to the IMCC as a success story in achieving the Institute for Healthcare Improvement's triple aim of improving patients' care experience, improving population health, and reducing per capita health care costs. "IMCC patients receive timely access to high-quality care that greatly improves patient and family satisfaction," says Esper. "They benefit from expanded program and service offerings that translate into lower cost of care for patients." IMCC data show that meeting patients' care needs in dementia, primary care, and mental health leads to better health and quality of life overall. For example: Increasing the number of screenings for depression and the Zoster vaccine (to prevent shingles and long-term nerve pain), IMCC nurses report, has improved their ability to monitor and treat "the whole patient." Such screenings helped the IMCC achieve a patient satisfaction rate of 97 percent (as of September 2016), exceeding Emory Healthcare's goal of 87 percent. Also, the National Committee for Quality Assurance designated the IMCC as a level 3 patient-centered medical home, the committee's highest rating. "Our dream for this clinic is to have a process in place that demonstrates value for patients and their families," Clevenger says. "The IMCC is not just about this one clinic. We want to create a best-practice model for integrating dementia and primary care that is effective and sustainable." Lloyd McCreary (shown with his wife, Mary) and Sara Baxter (shown with her brothers and mother, Virginia Baxter), serve on the IMCC's Patient and Family Advisory Council. Key to the success of the Integrated Memory Care Clinic is collaborating with caregivers to optimize patients' quality of life. That includes counseling them on the pros and cons of diagnostic procedures and treatments and what to expect and plan for during the early, middle, and late stages of dementia. Before Mary McCreary became a patient at the IMCC, her primary care physician recommended she have a routine colonoscopy. Lloyd McCreary, her husband and caregiver, resisted. "When I switched Mary's care to the IMCC, her nurse practitioner said she no longer needed a colonoscopy," Lloyd says. "Mary was at a stage where procedures like colonoscopies, pap smears, and mammograms no longer made sense." Mary was diagnosed with early-onset Alzheimer's disease at age 56. Now 63, she recently transitioned to hospice care at the personal care home where she has lived comfortably for almost two years. When Lloyd could no longer care for Mary at home, he explored different care options with the help of friends from his support group and IMCC social worker Laura Medders LMSW. "I'm a huge fan," says Lloyd, who remains on the clinic's Patient and Family Advisory Council even though Mary is no longer a patient. "The IMCC provided much-needed support and valuable information about what I should expect regarding Mary's condition and care." Sara Baxter, another council member, learned about the IMCC when she took her mother to see an Emory gerontologist. Baxter's mother, 81, has dementia coupled with high blood pressure and stage 4 chronic kidney disease. Baxter was sold on the IMCC after meeting Carolyn Clevenger, her mother's NP, and has used the 24-hour call line a time or two since moving her mother to assisted living. When Baxter noticed a bruise and skin tear on her mother's arm one Saturday, she texted a photo to Clevenger. "She saw right away that my mother's arm was infected," Baxter says. "She called in a prescription and saved us a trip to the ER." 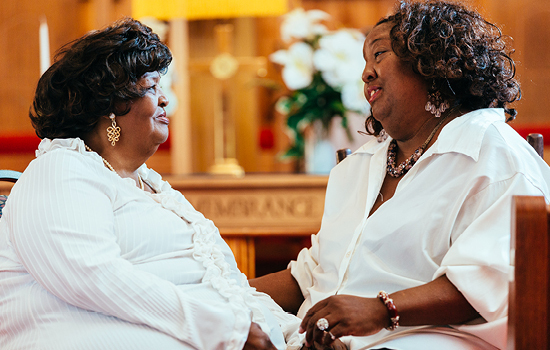 Jenny Loveless (left) and her daughter Terry Wyatt are devoted to their church, where Jenny sings in the choir. The nurses at the IMCC help Terry manage her mother's care for several conditions, including dementia. Terry Wyatt and Jenny Loveless are inseparable. The daughter and mother live within an hour's drive of the Integrated Memory Care Clinic, where Jenny has been a patient since 2015. "You don't know what a blessing the clinic has been," says Wyatt. The nurses there manage her mother's care for a variety of conditions, including diabetes, high blood pressure, atrial defibrillation, and low vision. Loveless, 79, also has dementia. "Most of mom's doctor's appointments are at Emory now," says Wyatt. "My mother didn't want to give up the heart doctor who put in her pacemaker, so the clinic coordinates her care with her heart doctor and endocrinologist at WellStar." The IMCC has made life easier for Wyatt, who cares for her mother and a teenage nephew at home. "Going from doctor to doctor was hard enough," she says. "The IMCC nipped that in the bud by providing most of her care in one place." Mother and daughter lead an active life together. They spend time at a local senior center, volunteer at two churches, work the concession stand during high school football games, and cater small events. Loveless sings at church every Sunday. She trained as classical singer in New Orleans, as did her brother. "Every day, we concentrate on conversing about mom's past," says Wyatt. "She talks to her brother in Los Angeles once, sometimes twice a day. She loves to be involved in things, and we do everything she wants to do within reason. We want to celebrate her while she's here." Gifts to the Integrated Memory Care Clinic help clinic staff provide high-quality services to patients and their families. To learn more, contact Amy Dorrill, associate dean of development and alumni relations at the School of Nursing, at amy.dorrill@emory.edu or 404-727-6264.